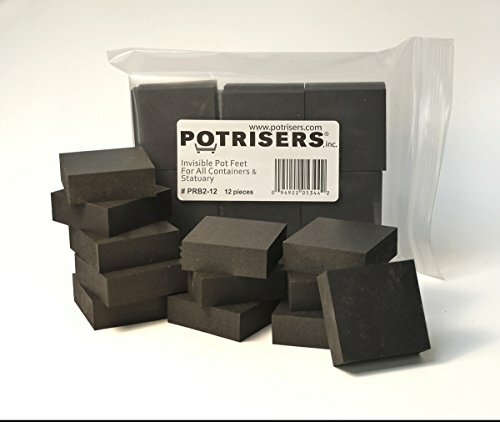 POTRISERS, made from 100-percent recycled material, were designed to be an eco-friendly, indestructible and low profile alternative to decorative pot feet, trays and trivets. While remaining hidden, POTRISERS can be fitted to heavy, pre-planted containers. Rubberized material grips surfaces while providing cushioning on hard or uneven surfaces such as wood, concrete, aggregate, compacted materials or stone. POTRISERS come in both retail and bulk packaging. Designed to protect and hide drip lines, POTRISERS allow for easy cleaning, discourage bug infestation and provide crucial drainage needed for healthy plants. By floating containers off the ground, pots are less likely to freeze and crack in cold temperatures. Stack them to level planters on slopes. Suggested Use: Equally space 4 risers beneath outside edges of pot. If using with a tray - place a set below the tray to prevent water rings or condensation on surfaces, and within the tray beneath the pot to allow the pot to drain freely. POTRISERS have been field tested by the Engineering Laboratory of the University of Washington for strength and field tested for durability. This larger riser, recommended for larger pots and statuary will support up to 12000-pound (per set of 4). Still the original and the best with a lifetime guarantee - beware of cheaper imitations! They prevent pot-skidding as well as staining and damage to decks and surfaces. Made in the USA and Canada from 100% recycled rubber; eco-friendly and indestructible. 3 risers support up to 9,000 pounds and most medium to large pots may only need 3 risers to achieve stability. Each Potriser is precision cut using a CNC Ultrasonic Cutting Machine with surgical sharpened Carbide blades to ensure uniformity. Potrisers come in two sizes: These are our larger risers 2"x 2"x" 3/4" ht. and are ideal for medium to large pots or statuary. If desired, Potrisers can be permanently attached to pots & statuary using a strong glue such as super glue. Potrisers are not recommended for use on vinyl or vinyl composite surfaces that are prone to be marked by other rubber products as well. If you have any questions about this product by Potrisers, contact us by completing and submitting the form below. If you are looking for a specif part number, please include it with your message.